Central Ayvalik has a lovely Ottoman and Greek charm. The narrow streets and pastel colored corbelled houses are always teeming with local life, whether children or adults going about their business. The architecture is usually neo-classical. Two of the main attractions nearby are the Sarmisakli beach and the Taksiyarhis Church. 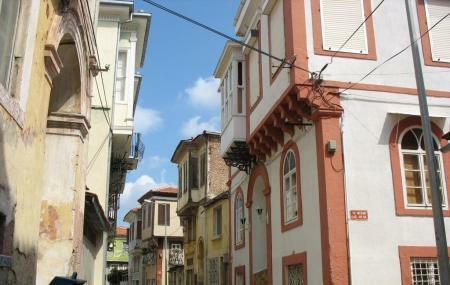 See if you can get your hands on “A Walking Tour of Ayvalik”. The guide is one of the best ways to cover old town and catch all its attractions. How popular is Ayvalik Old Town? People normally club together Sarimsakli Plaj and Saatli Cami while planning their visit to Ayvalik Old Town.